Try these 12 ideas for a low-maintenance log home landscape with little effort. Most people agree: the key to achieving curb appeal is a thoughtfully designed, well-maintained landscape. And though they may like the idea of manicured gardens with colorful blooms and stately shrubs with nary a weed in sight, most folks don't have the time to stain their thumbs any shade brighter than a pale greenish-yellow. While there's no such thing as a totally maintenance-free garden, there are techniques you can use to minimize the amount of work involved. Avoid using lots of beds and borders that need weeding and edging.The additional effort they require can add hours to your landscaping maintenance regimen. In areas where you have planting beds, use a generous amount of mulch to keep weeds at bay and reduce the amount of time you spend watering. Make your beds narrow enough so that you can reach across easily, but not so narrow that plants continually outgrow their bounds. Streamline garden care by grouping plants together according to their treatment requirements. It's easier to fertilize plants that are all in one place, rather than scattered throughout the property. Make your paths wide enough to negotiate with wheelbarrows and other large-scale tools. Choose tools that will simplify and speed up garden chores. Automatic sprinkler systems save hours of time and ensure consistent water distribution. Electric or gas lawn mowers are excellent for large swaths of grass, but for a small lawn, a hand-pushed reel mower is often the better choice. Most ground covers need little or no maintenance once they're established. As for weeding, a healthy, densely growing ground cover should choke out all but the most persistent weeds, and those that remain will be spindly and weak. Design your lawn to make it as easy to care for as possible. For example, instead of planting the lawn against walls or fences, install a hard-surface border around the edge at ground level. When you cut the grass, the mower's wheels can run along that edge and allow the blades to catch every bit of grass. Plant flowering shrubs for color and texture. Shrubs require less care than annuals and perennials. The good news: You don't have to give up flowers if you opt for low-maintenance flowering shrubs. A variety of shrubs produce attractive in-season blossoms, and many of them even are suitable for cuttings for indoor arrangements. Plant ornamental grasses. Most ornamental grasses need little care and look attractive for much of the year. Ornamental grasses can be a sophisticated addition to a floral border; a natural, softening effect along the edge of a pond; or an exuberant statement in a border devoted solely to different grass varieties. Use hardscapes creatively. Hardscapes, the landscaper's term for paving and built features in a garden (think patios and walkways) reduce garden work and extend your home's living space. Although more expensive at the onset, hardscapes are virtually maintenance- and cost-free once they're in place. Plant low-maintenance perennials and annuals. The beauty of perennials is that they pop up each year with little or no effort on your part. Some perennials can be demanding, however, so choose wisely. Though annuals must be replanted each year, there's a large selection that gives almost a continual bloom from early summer through the first killing frost. 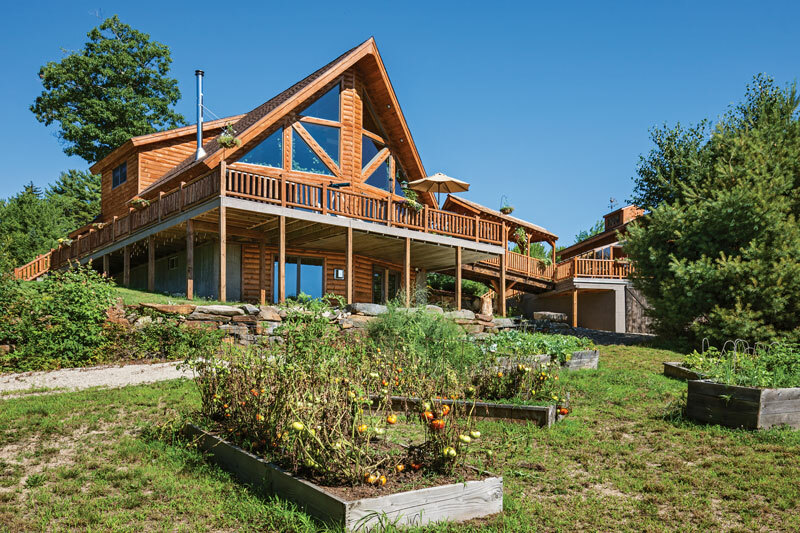 Planning a lush, natural setting for your log home? Edible landscaping options let you have your landscape and eat it too!